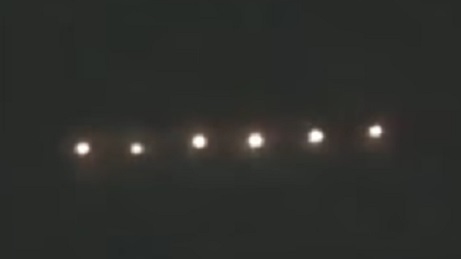 Here’s one new interesting footage of a bright unidentified flying objects hovering above the ocean near Rosarito in Mexico. This was filmed on 12th December 2017. These two UFOs were filmed in the sky above Liberty in Arizona on 11th December 2017. I seen two stationary lights that were orange, gold, yellow, silver, White, flickering and stationary lights that slowly disappeared, the right one before the other. I was traveling westbound on Northern Boulevard heading towards 303 when I noticed the lights. When I gotten on the 303 the lights continued to stay at the same height, they did not move left or right either. I shot some video of the lights because it was out of the ordinary for there is a lot of air traffic around the Phoenix area. I had exited Route 303 at Glendale Boulevard in pulled over to shoot the video. As I was shooting the video, the right light slowly disappeared and then the left about 30 seconds later.